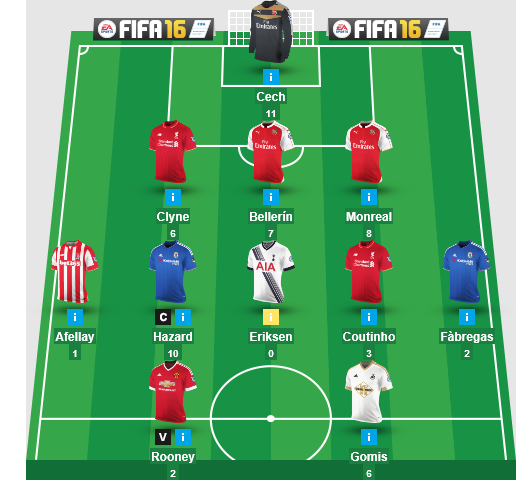 Sensibly, the manager has selected Bellerin, who seems bound to rack up points. Indeed, his defence looks exceptional, with Clyne and Monreal also in-form. This makes me think again that full backs are generally more likely to gain points, when it comes to fantasy football, at least. By comparison, the midfield looks decidedly ropey, with Afellay and Eriksen looking more like liabilities than credits, at this early stage. However, the skipper Hazard will make amends for their shortcomings, as will Coutinho. 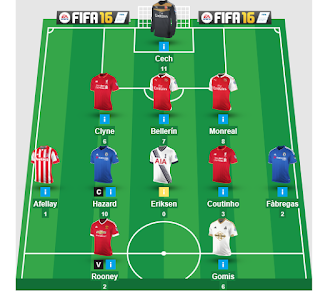 Cesc is still in his line-up, whereas I've outed Fabregas from mine following his poor early season return. I'm envious of Gomis, who is on fire, at the moment. Meanwhile, surely Rooney will put his goal drought behind him anytime soon. On the bench, the manager looks bereft of options, with Federici, Mings, Parades and Grabban getting splinters in their collective behinds. A lot of transfer activity ahead, me thinks.